Free mountain ski tours for your USA ski holiday! Guests often ask us how they can find their way around a new ski resorts without checking the ski map every 5 minutes! Mountain ski / snowboard tours are a fantastic way to orientate yourself & get to know the mountain. The guides will help you find the areas of the mountain which are right for your ability. They are full of tips and advice such as where to ski at what time of day, which lifts to take & where the quietest areas of the mountain are. Deer Valley offers complimentary group tours morning & afternoon with 2 intermediate & 2 expert level tours per day. Meet at the base of Sterling Express chairlift, Silver Lake Lodge & Snow Park at the base of the Carpenter Express chairlift. Learn about the ski runs, history & trivia, whilst being shown around the mountain, discovering secret powder stashes & new pistes. Park City is starting a new daily complimentary ski tour "Silver to Slopes" for the 2017 / 2018 ski season. With this new signature experience ski / snowboard tour guests can discover Park City's rich, mining, skiing & local history on this free guided ski tour. You will explore the mountain with an expert guide & uncover historic mining buildings & hidden relics scattered across the resort. You'll get insider tips on how to find the best runs on the mountain & take home a commemorative badge. 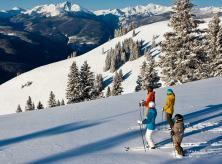 Aspen Mountains "ambassador" daily 1-2 hour orientation tour with Apple cider & granola bars! Meet at 10.30am or 1.30pm at the top of the mountain at the Guest services Center for Ajax / Aspen Mountain. Aspen & Aspen Highlands "History of the mountain & town" tour, run by the Aspen Historical Society. At Aspen Highlands Mondays only at 11am & 1pm meet at the guest service cabin next to the Merry Go Round. Aspen "Geology of Aspen Mountain" tour Wednesdays only at 10am & 1pm, meet at the top of the Silver Queen gondola at the Guest services Center. All the above tours are recommended for intermediate skiers / boarders & above. Aspen Highlands Bowl tour for expert level or above, wednesdays only from early Jan, 10.30am, meet at the guest service cabin next to the Merry Go Round. Vail ski resorts guest service volunteers provide complimentary 2 hour general tours of Vail mountain for intermediates & above. Blue Sky Basin tours are offered on Tuesdays & Fridays beginning at 11am. Recommended for high level intermediates or above skiers / riders only. Meet at Henry's Hut across from Patrol Headquarters at the top of Chair 4. 60+ ski with us tours are offered weekly for skiers 60 and older, who are advanced intermediate or above skiing ability. This complimentary all day tour is on Mondays only and meets at 9.15am at the top of the Eagle Bahn gondola at Gondoly's Pizza on the first level of Eagle's Nest. This is an opportunity to ski with a mountain host guide knowledgable about Vail mountain. Stop for lunch along the way & enjoy a social day of skiing with local & visiting skiers. Guests are asked to arrive 15 mins early for both those tours to sign release forms. Beaver Creek offers a women's 2 hour complimentary social ski tour led by female team of ski school ambassdors & instructors. The guides share tips & offer insider knowledge of the mountain & ski runs. Meet at the Centennial lift 10.15am on Tuesdays to Fridays. Intermediate & above skiers / riders are invited! Breckenridge ski resort offers 2 hour daily mountain orientation tours. Helps familiarise guests with the mountain. Recommended for intermediate & above skiers & riders.